Register now for "Ag Module 2014: Innovation in the Water Space"
On April 24 and 25, Florida Earth, in partnership with Southwest Florida Water Management District (SWFWMD), University of Florida IFAS, Florida Farm Bureau and Crystal Springs Preserve, will host the SWFWMD Edition of the Ag Module Series. 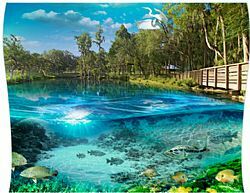 The first day of the two-day forum will be held at beautiful Crystal Springs Preserve just south of Zephyrhills, northeast of Tampa, and will feature speakers addressing agriculture's interaction with water and programs designed to enhance stewardship in this space. The second day will be in the field visiting sites talked about on the first day including a tour of the UF IFAS Gulf Coast Research & Education Center and SMR Farms. For agenda and registration, visit the link below.